BroncoAlert is Boise State University’s emergency notification system to broadcast messages throughout the University. University Emergency Management will only send messages through BroncoAlert for urgent situations that could impact the safety of lives and protection of property. How do I Opt-In to BroncoAlert? 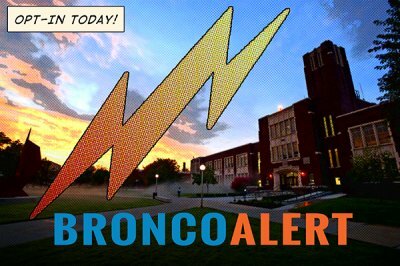 BroncoAlert is an Opt-In system; update your information on MY.BOISESTATE today so you can stay informed about emergencies impacting the campus.